Buy it now. All proceeds support the work of the Bisexual Resource Center. 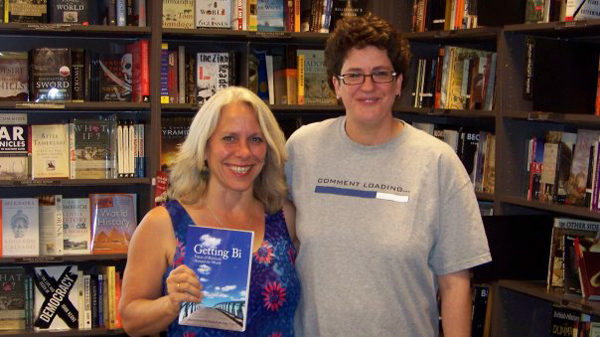 Getting Bi is a stunning collection of first-person narratives by bisexuals from around the world. The term “bisexual” functions as a useful shorthand for a broad spectrum of sexualities: as the editors note in the Introduction, some contributors self-identify as queer, pansexual, omnisexual, or labelless, while others acknowlege attractions to multiple genders while identifying as lesbian, gay, or heterosexual. This complexity infuses the book at every level, as writers differ not only in their definitions of bisexuality, but also in their politics, spiritualities, sexual practices, and patterns of daily life. The essayists include accomplished writers and bi activists such as Loraine Hutchins, Lani Ka’ahumanu, Carol Queen, and Amanda Udis-Kessler, as well as literary unknowns, many of whom are published here for the first time. Most of the essays are conversational in tone and personal in content, as the writers discuss coming out, the choice to identify (or not) as bisexual, life experiences, sexual desire, bi community, and political activism.